Penn State Public Media’s documentary “Water Blues, Green Solutions” explores the U.S. cities relying on innovative green infrastructure to combat their water challenges. 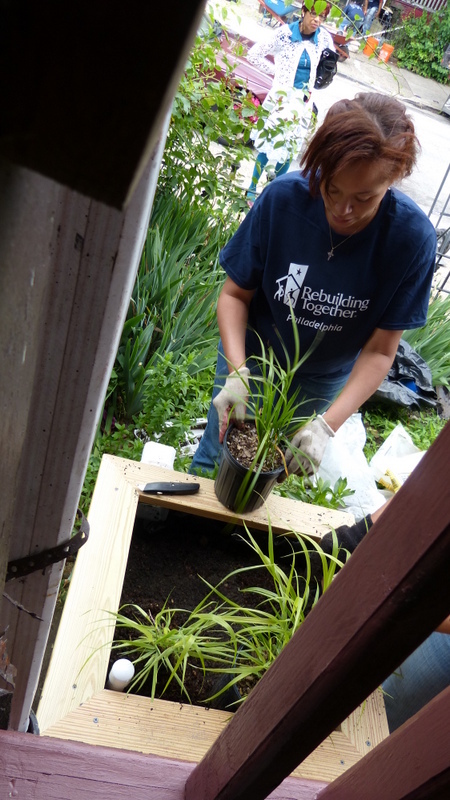 Rebuilding Together Philadelphia is a non-profit organization that provides free critical repairs, such as health and safety repairs and energy efficient work, for low income homeowners. From devastating storms and record-breaking droughts to expanding cityscapes and increased pollution, some experts say the nation is facing a water crisis. Recognizing this environmental dilemma, filmmakers at Penn State Public Media created an interactive documentary project to feature cities coast-to-coast which have adopted new ways of protecting, restoring, and preserving potable water sources. “Water Blues, Green Solutions” highlights Philadelphia; Portland, Ore.; San Antonio; and the Bronx in New York as cities that are using green infrastructure to solve their water challenges of flooding, pollution, and scarcity. “There’s a major problem, and there are communities engaged in solving it,” said Frank Christopher, the film’s director, producer, and writer. The documentary reveals that in Philadelphia, a mere one-quarter inch of rainfall can cause overflow of the out-of-date combined sewer systems, contaminating the Schuylkill and Delaware rivers and violating the federal Clean Water Act. Learning from groundbreaking innovations in Portland, Philadelphia’s leaders and the Environmental Protection Agency announced an agreement, “Green City, Clean Waters,” to dedicate $2 billion to decreasing urban runoff through green solutions, such as rain gardens and downspout planters. 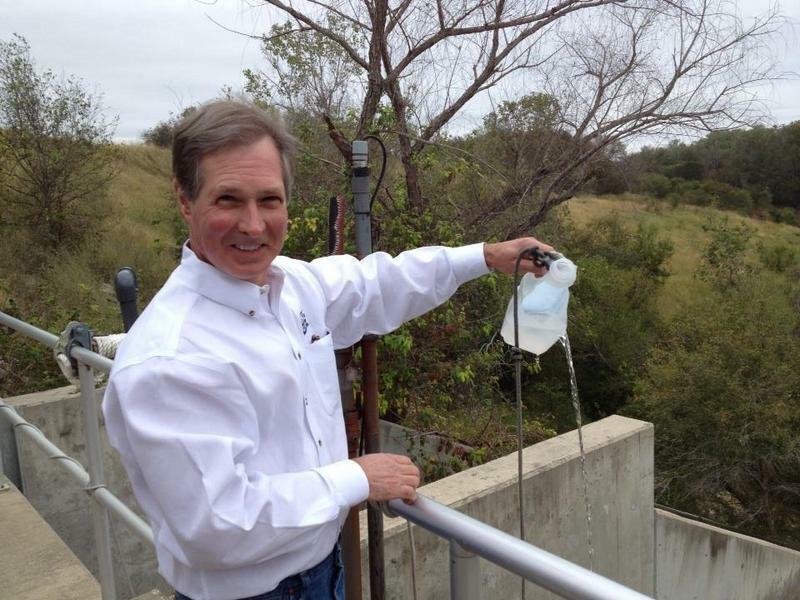 The Dos Rios Recycling Center in San Antonio transforms sewage into clean recycled water, compost and methane gas. Senior analyst, Greg Eckhardt, shows off the purity of the water after it goes through the center. Since the construction of Hunts Point Riverside Park along the Bronx River in 1998, there has been a community-wide movement to not only restore the river and riverfront areas, but to also increase the awareness and use of green infrastructure throughout the city. 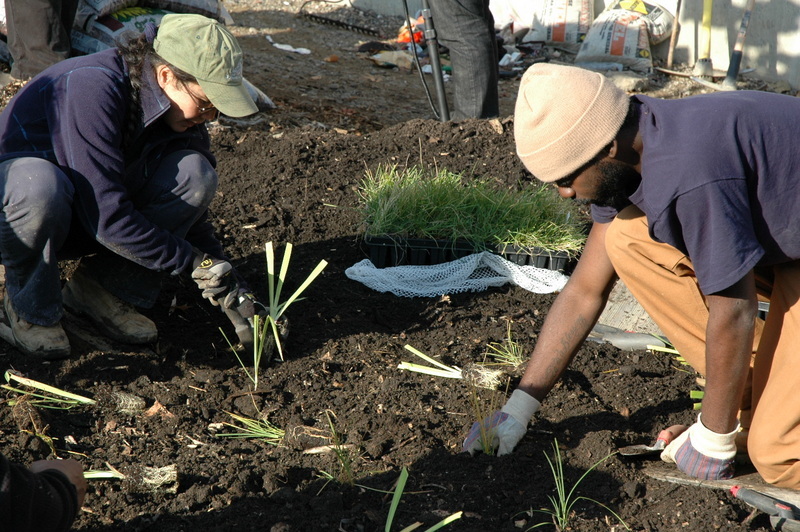 Pictured are two volunteers planting a garden in the Bronx. From Philadelphia’s adoption of green infrastructure, the documentary moves to the extreme droughts of San Antonio. The 2 million residents of San Antonio and Austin depend on the Edwards Aquifer, an underground cavern of clean water. But with a 60 percent population growth over 20 years and cyclical periods of drought, the Edwards Aquifer is under constant stress. The city consequently adopted a culture of conservation, initiating programs that limit urban development and pollution runoff. Like Philadelphia and San Antonio, a natural body of water neighbors the Bronx. Known as an open sewer, the Bronx River’s first restoration came in 1998, when residents joined together to create the first waterfront park in 60 years. That park sparked a movement, and now numerous organizations work to restore the 23-mile waterway. “Water Blues, Green Solutions” has received major funding from the Colcom Foundation and Subaru of America, with additional support from National Association of Clean Water Agencies, and will premiere nationwide on public television stations beginning in January 2014. The Water Environment Federation was a supporting organization for this project as well. For more information and to see the interactive trailer, visit www.waterblues.org.